Delivery from £19.66 to United Kingdom in 3 - 7 working days. 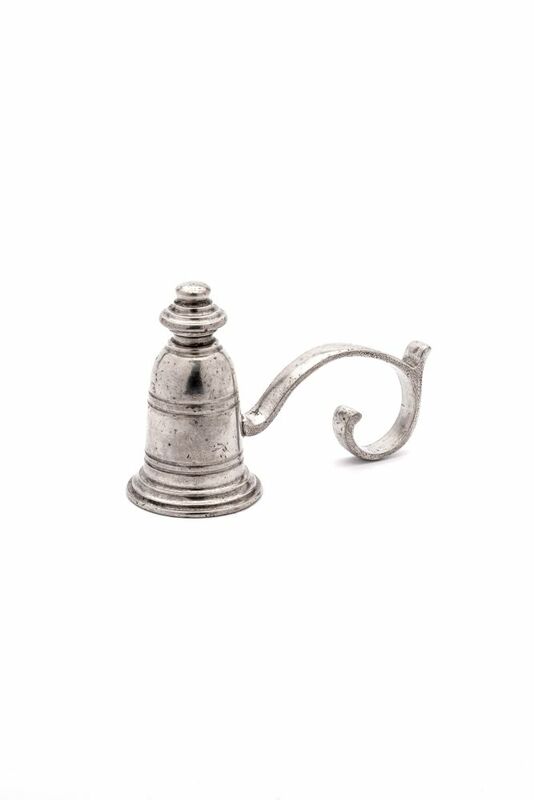 A candle snuffer made from pewter. The art of casters soon got respect and consideration. ou could become an apprentice only by legitimate birth and if believed honest and devout. The traineeship lasted from 3 to 8 years and it was particularly hard. If the trainee held up this period, the Master charged him with a test before living him any kind of qualification. Two older men were at the head of the workers. During the first phase the items is conceived and the technical drawing is realized. Alfredo creates the prototype by hand and after its final approval, we make the production mould. The pewter alloy is formed by melting the metal ingots into the melting pot at the temperature of about 300°C. Whilst the mould is rotating rapidly on the turntable of the centrifugal machine, molten pewter is ladled into the central orifice and is forced by centrifugal force through the runways into the mould cavities. After few minutes the metal cools and solidifies and the as-cast is formed.